No one likes negative balances (negative balances arise due to prepayments) so we have created this document to show you how we identify OEM (A & B grade) from non-OEM, or “High Copy” (Aftermarket). The purpose of identifying and separating OEM from Aftermarket is to significantly decrease your chances of experiencing a negative balance. This is most helpful for Vendors who take their 30% prepayments! The more accurate you are with your initial counts the better you will be able to estimate final payments and avoid having to send money back. We know how frustrating poor testing results are which can be further compounded by having to refund money to us. Please believe me when I tell you, our goal at Cash4lcds is to pass screens NOT reject them. We want you to get every last penny you can from your salvage which is why we have provided a number of tools (videos, pdfs, packaging instructions, how to’s, etc.) to maximize your return. OEM: Can be either A grade or B grade. 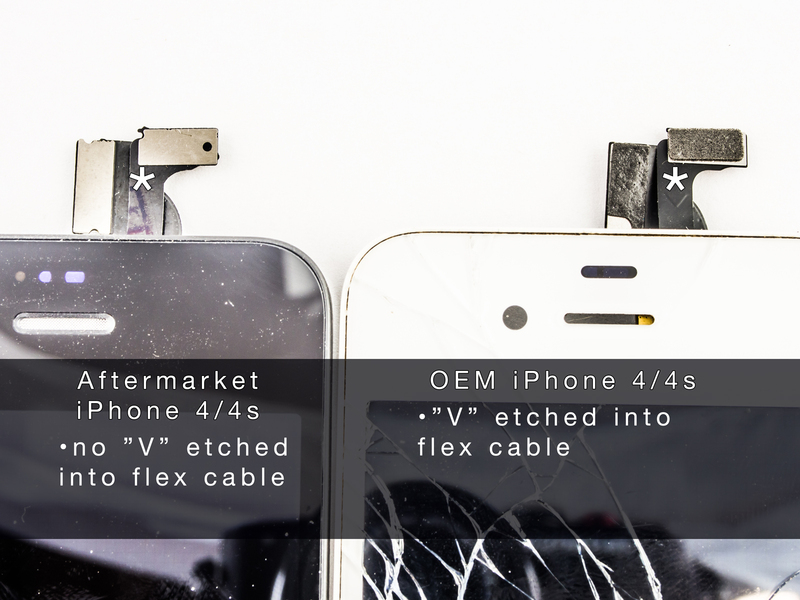 A “B grade” is an OEM screen with some defects that are still salvageable. 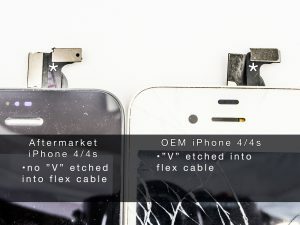 Aftermarket: Any LCD not produced by Apple. The iPhone LCD on the left is OEM while the LCD on the right is Aftermarket. There are 2 lines of code on the left and 1 line of code on the right. 2 lines of code means OEM, 1 line (or no lines) is Aftermarket. 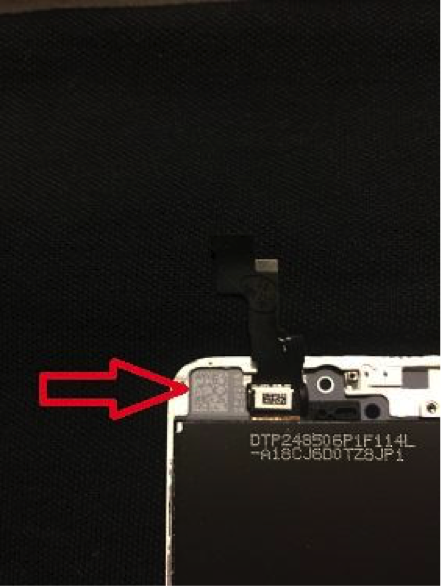 Located at the base of the flex cable there will be a white bar coded sticker or not. An OEM flex cable will have the sticker an Aftermarket flex cable will not. 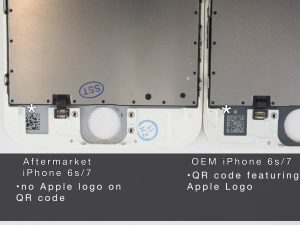 The white sticker must be present to be considered OEM. Lastly, and sometimes not so obvious, there is a matte black covering on the top left corner of the LCD (red arrow, pictured below). If the sticker is missing and there is what appears to be a “bar code” (example below), then the LCD is considered Aftermarket. 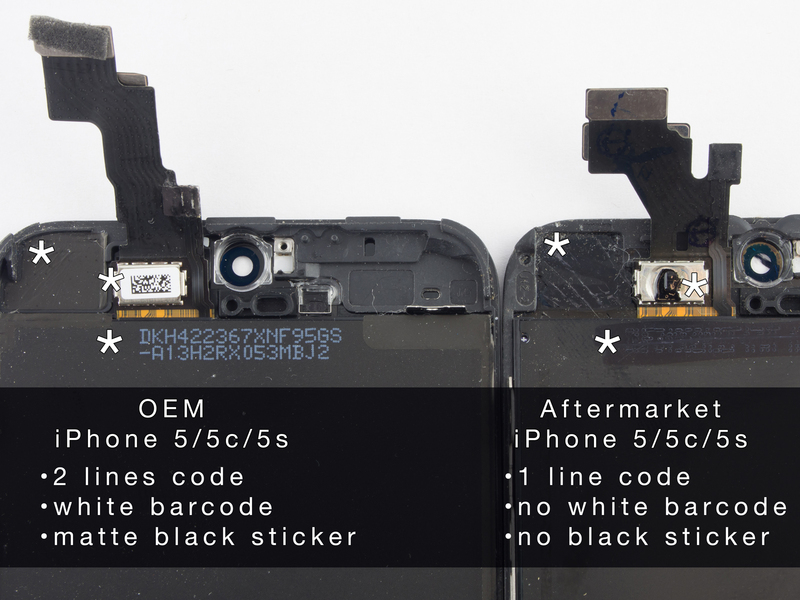 OEM iPhone LCD’s will have the matte black sticker. 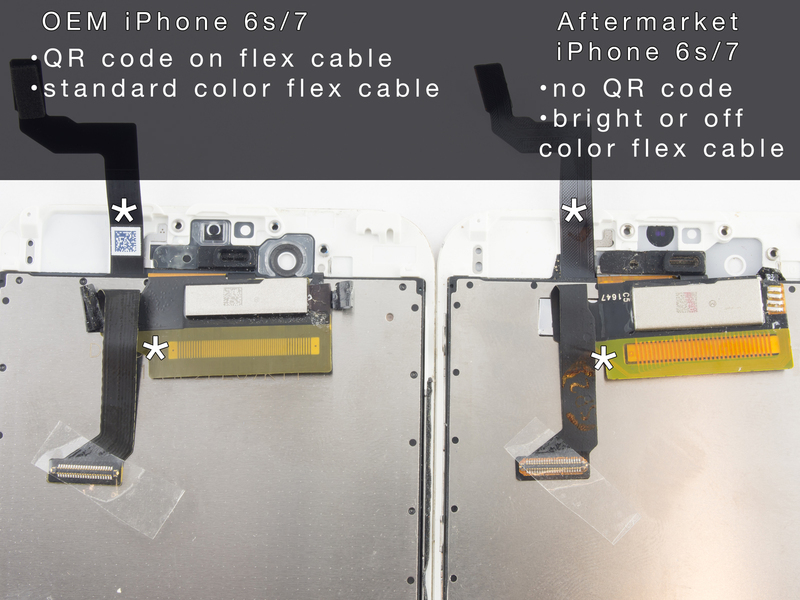 OEM (pictured left) has QR code located at the base of the flex cable. The color is a dark green with straight lines. 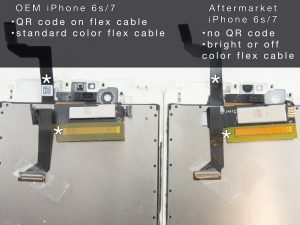 Aftermarket (pictured right) will not have QR code on the flex and the color of the flex cable is brighter with wavy lines. An LCD may only exhibit 1 of the identifiers, but it only takes 1 to know it is an Aftermarket or previously refurbished LCD. Refurbishers are constantly trying to out-smart buyers into paying higher prices for non-original LCD’s and are getting better all the time. Like the fake Gucci vendors on the streets of New York, these refurbishers do everything they can to pass their fakes as original. Check back to this page often, if there are any updates they will be added accordingly.